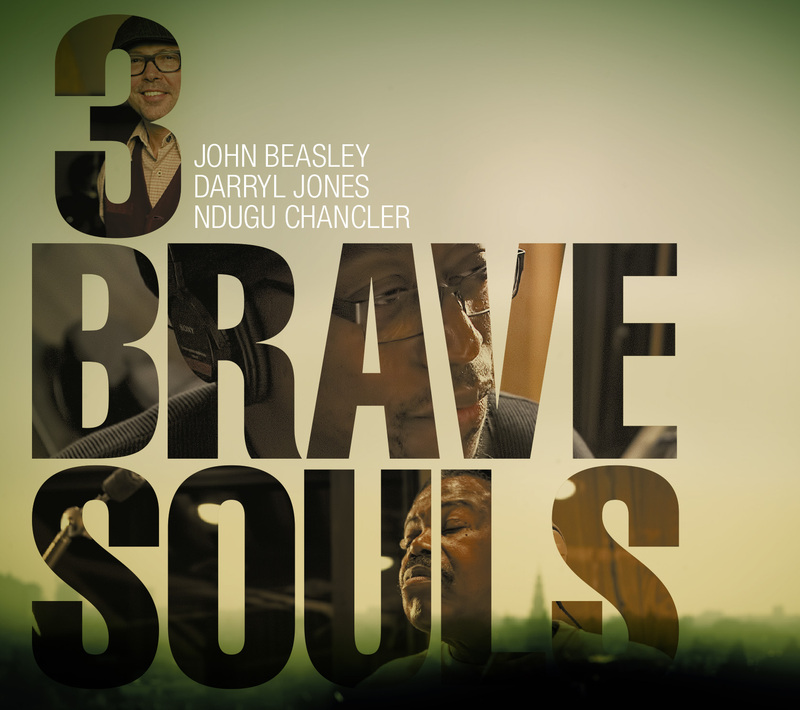 Three generations of Miles Davis alumni having fun playing progressive roots music – keyboardist John Beasley, bassist Darryl Jones and master drummer Ndugu Chancler – join forces in a formidable new funk trio called 3 Brave Souls. From the revved-up, rootsy Meters romp “Wanna Get Away” and the downhome “Nothing Left to Say,” both featuring the remarkably soulful vocals of Sy Smith, to the hard-hitting Fela Kuti like instrumental “Yabis,” 3 Brave Souls make a potent statement on this debut outing. The aptly titled “Nail it Down” is a thick pocket groover with spoken words of wisdom by Ndugu. The mellow ballad “Come and Gone” is a showcase for Jones’ melodic penchant on the bass while Beasley conjures a hypnotic world music vibe on the exotic “Ayala.” Guest harmonica ace Gregoire Maret is featured on the lovely and lyrical “N2U,” Daryl Jones showcases his vocal ability on “Stay” with a Sly Stone-ish sound; and Sy Smith returns for the gorgeous ballad “Love’s Graces,” which Beasley wrote. John Beasley who is the consummate musician, composer, and music director has worked with Chaka Khan, James Brown, Steely Dan, Queen Latifah, Aretha Franklin, and is currently the Music Director for ABC-TV “Duets” (featuring judges John Legend, Robin Thicke, Jennifer Nettles and Kelly Clarkson). Beasley wrote infectious songs that leave your foot tapping. His jazz background includes eight years with Freddie Hubbard and an eye-opening year (1989) with Miles Davis. Beasley’s previous record, Positootly! was nominated for a 2011 Grammy Award. Bassist extraordinaire Darryl Jones is one half of the funky rhythm tandem in 3 Brave Souls. With his rock, jazz, blues experience playing with Miles Davis, Michael Jackson, and since 1993 touring with the Rolling Stones, groovemeister of the highest order, Jones’ credits include work with such pop stars as Cher, Madonna, Sting, Lionel Richie, Eric Clapton and Peter Gabriel. The distinctive drums on Michael Jackson’s “Billie Jean” could only be Leon “Ndugu” Chancler. With a list of studio recording credits as long as the Dead Sea Scrolls, inventive drummer and consummate timekeeper, Ndugu has recorded and toured with Santana, Miles Davis, Michael Jackson, Herbie Hancock, George Duke and Weather Report. 3 Brave Souls, Beasley, Ndugu, & Jones, came together to write listenable, danceable melodic music bringing the funk and plenty of downhome soul, with an undercurrent of jazz sensibility to move you to the dance floor! "“they collectively stir up a melting pot of jazz-funk, organic grooves, and soulful sounds resonate feverishly through the walls of these eleven songs is uplifted to greater heights by an extraordinary cast of guest performers”"
"...In the most powerful moments Ndugu Chancler, Darryl Jones and John Beasley pay tribute to casual jazzfunk – without any flourish, confident vibration but a lot of vibration...."